Apple has sent the iTunes 11.1.2 update to the Apple iTunes software for the Windows & Mac OS alongside the various announcements and releases, such as the iOS 7.0.3, the announcement of the iPad Air and the iPad Mini 2, while making a few other paid softwares available for free this time. The new update comes with extra languages support, smoother in performances and there are a few more changes done with this. The iTunes 11.1.2 comes with not much a difference than the earlier version, but the Mac version did have the needed changes, to bring the support for the OS X Mavericks, and this being the most common music players for the Mac and iOS users, the update can be quite necessary as this brings in quite a lot of changes to the performance and stability of the app. If you haven’t opened Apple iTunes in the past few hours, you might now see a notification when you open the software, and that would be about this update available already. No luck? then go to the Apple Software Update section which would search for an update for you manually, and you can update the iTunes to the latest version from there. The previous version of the iTunes was a major upgrade from its earlier one, because Apple had released the iOS 7 and the iTunes update had come with the support for that iOS version. There were new features such as the iTunes Radio which was a new way to discover music and choose from hundreds of stations, and the user can even start a new station. There was Genius shuffle, podcast stations and quite a lot more features included, but the focus was on the Syncing ability with the iOS 7 which was the new OS version sent to the compatible Apple devices. Firstly, you need to open Apple iTunes and the message would flash that an update is available. 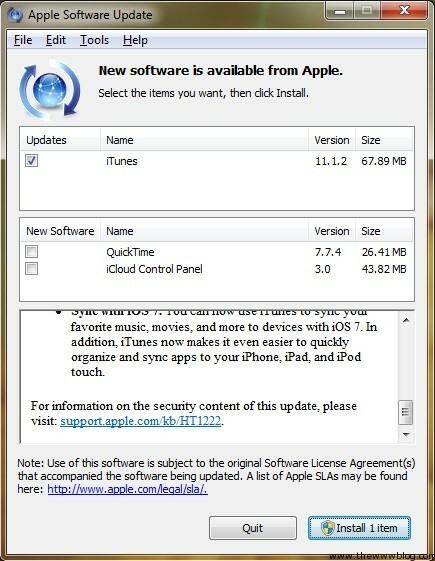 You can click on Download iTunes and that would take you to Apple Software Update section. If this message doesn’t flash at all for you, then directly go to Apple Software Update tool in your computer, as in the next picture. The Apple Software Update would search for an update and then let you know that the iTunes 11.1.2 version is available for download. Select that and in the bottom, select “Install 1 item”. 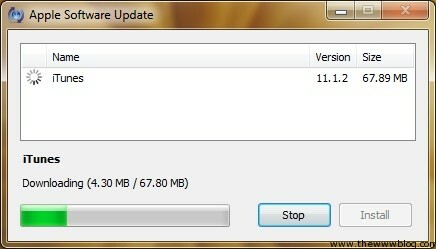 The tool would start downloading the update and then install it. There is no restart needed for the installation to be completed. Once the iTunes 11.1.2 version is installed, the Apple Software Update would let you know that the software has been successfully updated. If you are trying to install the Apple iTunes for the first time in your computer, go to apple.com/itunes and download the fresh installation file from there, and it would be the latest version that Apple would provide you with.